Though every organization can benefit from a robust risk function, it’s often only regulated sectors such as banking and insurance that will have established one. At the same time, risk management is increasingly becoming formalised and integrated. Organizations see the need for risk management in order to keep up with changing economic and market needs, but leaders are finding it hard to find the right talent to take up the challenge of implementing risk management best practices. Thus, those certified to have a set of skills and knowledge will help you stand out to prospective employers. It’s human nature to stick to what we’re comfortable with, whether it’s because of our background experience or our specific interests. Chances are, risk managers have come to their line of work from a variety of different departments or business functions. However, ERM is about breaking down the traditional silo-ed approach of risk management, by looking at big-picture objectives and encouraging a collaborative, holistic approach. 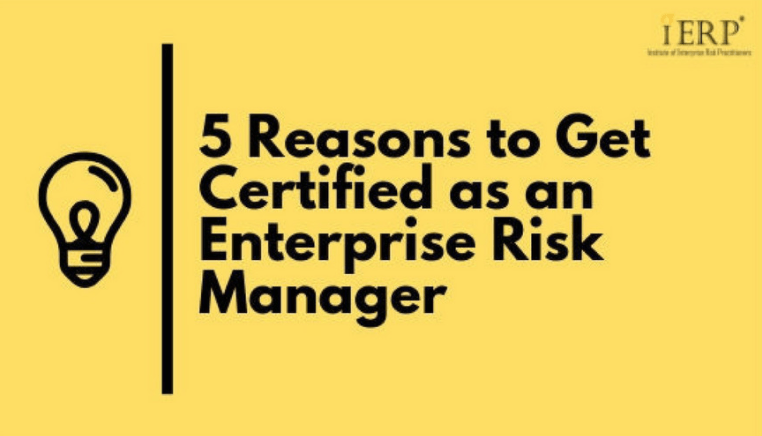 As such, an indicator of a good risk manager is the ability to take into account multiple perspectives — more so when it comes to Enterprise Risk Management. In a structured training program, you meet like-minded peers and mentors equally committed to their career ambitions and growth. The professional relationships you foster and the network you build will be an invaluable resource — not just for the opportunities you can gain professionally, but also for the shared knowledge you will have access to from fellow risk practitioners. Risk management was a discipline that emerged through ad hoc needs, and until now, professionals still often come to this field of work by learning and gaining experience on the job. There is no clear, mapped out path for being a risk manager. However, by becoming certified, you are signalling to your current as well as potential employers that not only are you committed to advancing as a management professional and leader, you also have the skills and knowhow to add immense value to any organization. Again, given the relatively underdeveloped nature of the discipline, professionals who have built up a skillset in ERM will be pioneers in relatively uncharted territory. Effective ERM allows you to improve the strategic decision-making made at the top levels of your organization. By going through a formal certification program, you gain an arsenal of formal skills and knowledge that you can pull from. A large part of effective risk management is creating and identifying opportunities, aligning any value-adding activities to organisational activities; by becoming certified in ERM, you’ll have the facts, qualification, and authority to back up the strategic decisions you want to make. The best practices and case studies you would have learned about will arm you with the confidence to guide your organization towards achieving its objectives. 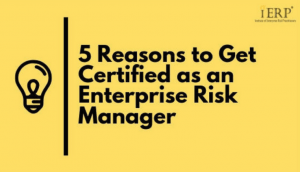 Whether you’re just starting out as a risk manager or have a few years under your belt, you will be able to benefit from gaining a certification in Enterprise Risk Management — both for your professional development as well as your career advancement.